Skills and abilities: Well trained in armed and unarmed combat. Powers: He is a baseline human whose powers are granted by his Cryo-suit. 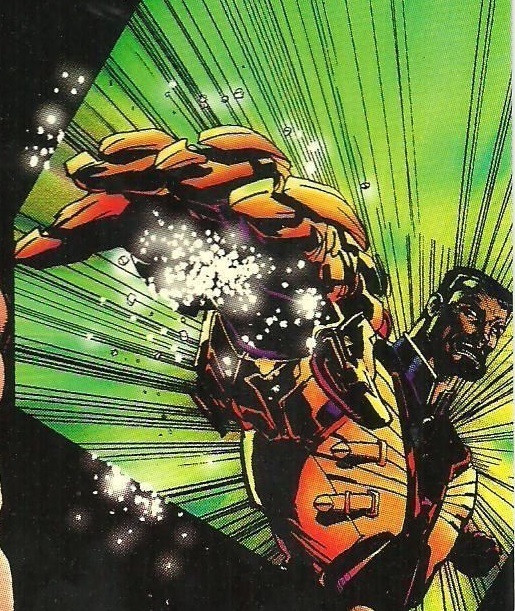 Equipment: He wears a cryogenic induction suit that channels intense cold blasts and ice. It also grants him enhanced resistance to injury and superhuman strength. He grew up in an affluent upper class family. Bored with his life he tried his hand as a hired killer. He does business, that of assassination under the Pseudonym “Out Cold”. He is highly proficient as an assassin so much so that he developed a reputation. Overtime he stopped enjoying his job because they lacked challenge. He was hired by Anthony Franco the self styled crime lord of New York City. He dresses flashy to inspire conflict and also masks his upbringing by using urban vernacular [Tribe #1]. He shows up at the Hype Club after commandeering a cab and cussing out the driver after freezing his head and leaving him for dead [Tribe #2]. He broke into the club after killing and maiming the security. Inside the club he demanded an audience with Alexander Collins. He was met with spirited opposition by the cyborg Hannibal. After a long fight he used a grenade to cover his escape [Tribe #2].